Monday, 12 October 2015. I lugged my pregnant body out of bed after another restless night of sleep. The baby’s “double bubble” in his/her tummy had once again increased my level of amniotic fluid to exceedingly uncomfortable. The soonest I could get booked in for induction was Wednesday, and with the way I felt, it couldn’t come fast enough. I showered, enjoying the brief relief from the discomfort. It seemed to wash all my troubles away for a moment. After breakfast, Leon took the kids upstairs while I spent some time with God. I began to feel cramps. I thought it was nothing because I’d had these types of pregnancy pains off and on in past pregnancies — and they usually carried on for days. I got my rice heating pad to use as my only form of pain relief. Not long after that, I realised the cramps were becoming regular. Contractions. I started timing them. My friend Helen sent me a text to ask if she could come around to help. I hesitated because Leon was home, but she insisted. She came and helped me put all our extra food in the freezer (since we knew we’d be away for a few weeks). Meanwhile my contractions grew stronger. They were strong enough that I needed to drag a chair into the kitchen to sit while Leon and Helen worked to get things done. It’ll be nice to get everything done before we go to Newcastle Wednesday morning. By 11:00 I was finally convinced I needed to ring the maternity ward at the hospital in Newcastle. My contractions were getting stronger and not relenting! The midwife I spoke with advised me to come in. A flurry of packing and arranging childcare happened. Just before Leon and I headed out the door, I explained to Asher that we were going to Newcastle so Mummy could have the baby. 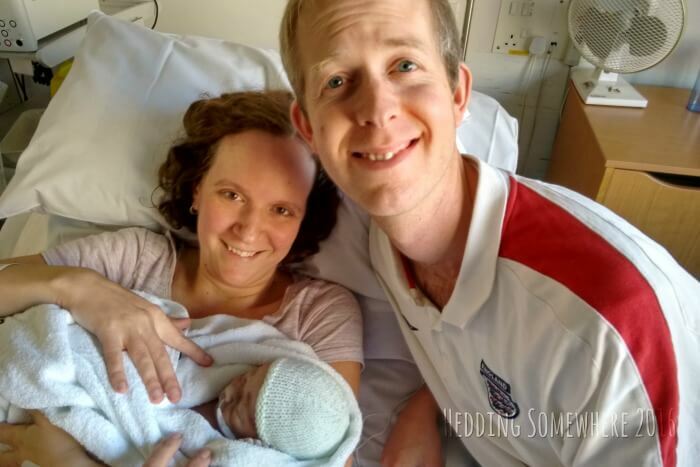 Once we got in the car, I said a quick prayer that we wouldn’t have to deliver this baby in a layby on the A69, and we were once again off to Newcastle. I expected my contractions to slow down once we were on the road, but they didn’t. The hour and a quarter drive was passed by timing contractions and bracing myself for pain every time Leon approached a roundabout. We arrived at the hospital at 1:15 pm. A midwife triaged me, and said I was dilated 3 cm! Active labour! I was admitted and transferred to a room on the delivery suite. The midwife looking after me introduced herself as Midwife T*, and explained that the consultant was going to break my waters because I had so much. It was a surreal experience. Obviously, I’d had my waters break before, but never artificially. There was so. Much. Fluid. You may describe it as a small lake on the floor. After it was cleaned up, the consultant said she’d check on me in 4 hours. That was at 3:20 pm. Midwife T stepped out of the room as my contractions began to increase in intensity. I was grateful for my two favourite forms of pain relief — gas and air and praying in tongues. I began to feel pressure. “Leon, I feel pressure, go get the midwife NOW!” I frantically cried. Midwife T returned to the room just in time to catch the baby. At 3:35 pm, just 20 minutes after my waters were broken. I was shocked that I went from 5 to 10 centimetres in 20 minutes! Leon exclaimed, “It’s a boy! Chrysti, it’s a boy!” Our baby boy was placed on my tummy for a few minutes before he was whisked away for a physical examination. He was beautiful, and I told him that. As a medical team from SCBU (Special Care Baby Unit) entered the room, Midwife T asked if we had a name.